If you’ve accidentally sent a message on Facebook Messenger or just wanted to remove a message from a chat, you can now do so for everyone in a chat. From this week, you’ll have the ability to remove such messages altogether and you’ll have up to ten minutes after sending it through. Thanks to this much-awaited feature, all you have to do simply tap on the message you want to remove and select the option to “Remove for Everyone”. The removed message will be replaced by text alerting everyone in the conversation the message was removed. If for some reason you can’t stand a message you’ve sent out, you can also remove a message just for yourself by selecting “Remove For You”. When you choose this option, the message will be removed for you, but not for anyone else in the chat. Instagram is reportedly working on a new kind of stickers that will help brands further increase engagement with their Instagram Stories. This feature allows users to ask their followers a question and provides a series of multiple answers for them to choose from. This Quiz Sticker for Instagram Stories is different from Poll Stickers as people who answer can actually find out what the right answer is. For now, there isn’t a lot of information on hand, so we’ll just have to wait patiently for updates. Millions of people around the globe use Pinterest as a visual discovery toll to get beauty inspiration and have saved billions of beauty Pins, making “beauty” one of the most searched categories on the platform. Now, Pinterest wants to make it as easy as possible “for everyone to find the most relevant hair and makeup Pins for their skin tone, style and life.” Earlier last year, Pinterest started testing an “inclusive search feature on the web” which helps users narrow their beauty results by skin tone range. Pinterest announced that “skin tone ranges” is launching on search and it will also be made available on mobile, bringing personalised makeup and hair ideas on the go. In the upcoming weeks, iOS users can select a palette to narrow their search from the relevant drop-down in the upper left corner of the app. Facebook is reportedly working on a unified messaging inbox for businesses that would allow admins to respond to messages and interactions in one place. This feature will add Instagram Direct messaging to a page owner’s messaging inbox within Facebook Pages Manager app on the web and mobile. In addition, this function would only exist on the front-end for business page managers and users would not be able to see the difference when their message is answered. This would be a great tool for businesses to track all the engagements with their customers and make it easier for community managers too. That world-famous Instagram egg has cracked online to share an important message with the world. The account was created by a British ad executive, Chris Godfrey, who wanted to see if something “as universal and simple as an egg” could exceed some of the world’s biggest stars. Since the first post, on January 4, the egg beat Kylie Jenner for the most likes on an Instagram post in just 24 hours and gathered more than 52 million likes, amassing over 10 million followers. This week, instead of revelling in its 15-minutes of fame, the egg used the platform to do some good. Over the course of six posts, the egg appeared to show cracks in parts, before it completely broke apart in a short, animated video, posted overnight. In the video, the egg grows little eyes and essentially cracks under an intense amount of invisible pressure. It blames the pressures of social media for its untimely demise and points stressed our social media users to talkingegg.info – a website which points people to helpful resources. Wow. The world’s ugliest shoe is now the bag that no one asked for. In a collaboration with edgy LA brand PizzaSlime, the cross body bag is basically made up of the infamous clog with a zipper where the sole of the shoe would go and an adjustable body strap. Oh, and it also comes with seven detachable Jibbitz charms. If seeing the bag itself ain’t enough to deter you, the price is just as repulsive. While a pair of classic Cros will set you back roughly around $60, this thing costs a whopping $414. Just when you thought the whole thing couldn’t get more ludicrous, it turns out the bags, which come in yellow and black, are also subject to a “limited release”. 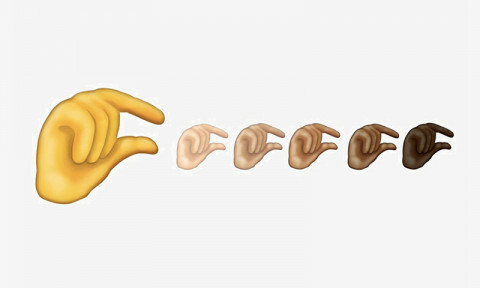 A batch of new emojis are coming out this year – 230 to be exact. That means we’ll soon be getting a whole bunch of useful additions, including waffles, a sloth and an axe. They’re also getting more diverse, with new emojis for mixed-race couples and a ton depicting various disabilities. There was one emoji in particular that has caught the attention of social media users: the pinching hand. While that most certainly looks like a hand ready to pinch someone or something, it also looks a lot like the symbol when you want to say something is small. We’ve seen the most perfect buns shared on Tinder nightmares but now perhaps here lies the best response to an unwanted snap of a male suitor’s appendage. Josh and Austin, who have outraged MKR viewers with their rude comments, have revealed how they landed a spot on the reality show. The homeschooled brothers have been the main focus of the cooking show this season with their behaviour and insulting comments about rival teams’ food and appearances. In an exclusive interview, Josh and Austin have spoken about how they ended up on the show, revealing they were actually headhunted by producers. They’ve actually never even heard of the show before and were initially apprehensive to say yes because they were worried they weren’t experienced enough in the kitchen. Here’s where it gets really cooked. One of the brothers, Austin, literally knows nothing about cooking and has never “set foot in a kitchen”. The brothers revealed that producers were well aware of their inability to cook but still told them to sign up with the promise that they’d guide them through the cooking process. While it’s not that shocking that they poach contestants who they think will bring entertainment to the screens, the fact that they allowed someone with absolutely zero culinary skills on the show and promised to coach them through is just… unbelievable.